Staying green in summertime can be difficult, especially when you live in a place like Houston, Texas. By the end of July, early August, once verdant, green lawns are burned brown and once beautiful spring flowers are shriveled, scorched from the heat of the sun. Everyone’s lawn looks like it needs a healthy dose of Miracle Grow. But as tough a chore as keeping your lawn green can be in times of intense heat, it can be even tougher to keep your soul green. When the sun blazes down from the circumstances of life and scorches dreams, hopes, and contentment, at some point you realize the green growth that once existed has turned to brown, crackling blades underneath your feet. Instead of reflecting beauty, joy, rest, and refreshment, the parched soul starts to shrivel, in desperate need of a deep drink of water. To be honest, summer time is usually a time where it is easier for my soul to stay green. The circumstances that normally drain my water supply are alleviated, and I can take a deep breath in and relax. No homeschool, no carpool, no after-school activities, playdates or appointments. No teaching commitments. Just. Rest. The real challenge isn’t staying green in the summer; it’s staying green come mid-August when the beginning of school and fall commitments commence once again. And if I’m not careful, I can begin to be anxious, hoping and praying for a good dose of Miracle Grow that will somehow sustain me until Thanksgiving. But as believers in Christ, there’s a way to stay green, even in the driest of seasons, as long as you know where to find water. My mom gave me a book to read this summer called Green Leaf in Drought-Time by Isobel Kuhn. The book is out of print, but she heard about it on Nancy Leigh DeMoss’ radio program called Revive Our Hearts. It’s a short, slim book, not a heavy read. But it’s pages are full of life-sustaining truth. The book is the true story of Wilda and Arthur Mathews, the last missionaries from the China Inland Mission to escape from China when the Communists took over in the 1950’s. Their journey of escape took several years, and this committed couple and their toddler experienced set back after set back in trying to get out, but after years of waiting in drought, they not only escaped with their lives, but escaped with their souls still in full bloom, still green. And that is the point of the biography. The author examines how under extreme stress, in conditions of severe drought, when to every apparent eye there was no water, the Mathews “leaves were green and were not anxious in a year of drought and did not cease to yield fruit” (Jeremiah 17:8). Not a popular topic to write about or examine today. Today, most books and sermons and self-help talks are about how to get out of drought, rather than learning how to stay green within it. But here’s the thing: God does not promise us drought-free circumstances. But He does promise us drought-free hearts when we “extend our roots by a stream,” a stream of living water that never dries up, and never ceases to give the supernatural refreshment for our souls we so desperately need. Can I ask you something? The same two questions I asked myself when I read the first sentence of the book. Have you accepted the fact that God allows suffering and discipline and seasons of drought in your life? And if so, in those seasons, are you disciplined enough to go in search of water? As Americans, we spend so much of our time refusing to accept or even acknowledge God’s sovereignly ordained seasons of discipline in our lives, trying to dull or explain away the pain or troubles with every known remedy under the sun. But what if you and I, instead of trying to explain the season away, or search for a ten-step-formula out from underneath the circumstances, submitted to God’s Hand over the circumstances, learned to trust Him in the lessons He is wanting us to learn, and then went hard after water? Christian, you and I never need to fear drought, because we always know where to find water. On the last day of the Feast of Booths in Jerusalem, Jesus stood up before the masses of people and cried out: “If anyone is thirsty, let him come to Me and drink. He who believes in Me, as the Scripture said, ‘From his innermost being shall flow rivers of living water'” (John 7:37-38). Our drink from the water of life isn’t a one time stop when we go forward or bend the knee to make a decision to submit to the Lordship of Christ. It is a perpetual posture of the soul. We are to keep coming and keep drinking on a day-by-day, sometimes moment-by-moment basis. The state of your soul absolutely depends on how much water you’ve been drinking. Wilted soul – no water. No Words of Christ. Vibrant soul, even in conditions of drought – well-watered soul. A soul that stops to drink on a regular basis, receiving Jesus’ Words, believing Jesus’ Words, letting Him in. In conditions of extreme drought, time and time again, it wasn’t a magic formula that saved Arthur and Wilda Mathews, it wasn’t a committee from the China Inland Mission working to get them out (although they tried), it wasn’t a conversation with friends (they had no friends in their remote corner of China), and it wasn’t a meal out or the comforts of home or the luxuries money can buy (there were no luxuries to be had). It was, time after time, the Word of God, applied to their hearts and minds through prayer and thoughtful meditation. When I think about the Fall, as far as I know, I do not have to face the drought of a Communist Party takeover, or the threat of execution, or the daily basic needs of survival. My worries about drought are much less severe. But I have the privilege of knowing where to go to find water and how to spread my roots out before the presence of the Lord in His life-giving stream, just as the Mathews did. Whatever season the Lord has you or me in, let’s embrace it. Let’s not fear the scorching heat of summer or the withering power of the sun. Rather, let’s renew our commitment to keep coming and keep drinking the water whose source never fails and who never ceases to enable us not only to stay green, but to bear fruit, even in the driest of times. For more on learning to bear fruit and drink from the water whose source never fails, read “Waiting on the Lord: Waiting for Fruitfulness” or listen to the talk “Waiting for Fruitfulness,” coming in September 2016. Sometimes we don’t run on our own two feet; sometimes we run on our knees. That’s how I felt like running last Friday when I woke up and heard the news about the shooting in Dallas…and the shooting before that…and the shooting before that. There really aren’t any good answers or any good new running techniques we need to adopt into our routine. What we really need to do is shut our mouths, take off our shoes, and hit our knees. Pray. Call out to the God who holds the only answers in His Hands and and the message of the Gospel in His Heart. 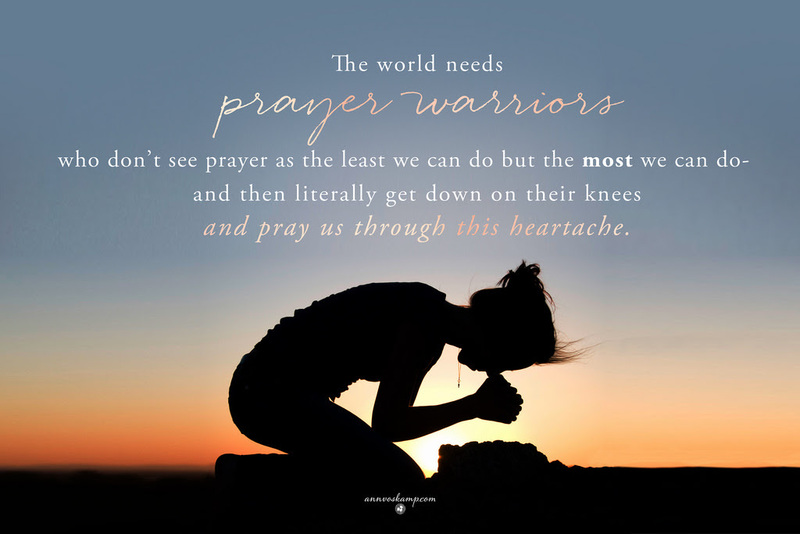 I loved this image I saw on Ann Voskamp’s blog, www.aholyexperience.com. It seemed to say it all and say it well. Would you commit with me each and every day this week…to pray? Pray before you say anything in the heated dialogue. Pray before you enter the race with your running shoes. Pray before the feeling passes and you turn to start working on or thinking about other things. Consider reaching out to a pastor on your church staff and asking if your church can call a special time of prayer for our nation and the victims and families of the shootings. If praying at your church isn’t a possibility, consider gathering with one or two family members or friends this week and praying. “For where two or three are gathered in My Name, there am I among them” (Matthew 18:20). Monday – Pray for the comfort and healing of the hearts of the families of the victims who were shot. Pray the injustice done to them would not be fuel for the fire for more injustice but would be a radical opportunity to forgive and experience the knowledge of the saving grace of Jesus Christ first hand. Tuesday – Pray that the church would PRAY. 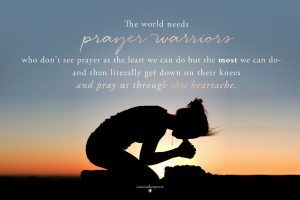 Pray that she would respond on her knees and reach out across any dividing lines to gather as one body in cities and towns around our country and pray. Wednesday – Pray for healing in the hearts of law enforcement officers around our nation. Pray for protection as they work to protect us, pray for conviction to act in wisdom, justice, and compassion in any and every situation, and pray for healing from loss and from any and all racial discrimination or hatred. Thursday – Pray that the church would RESPOND. Pray that where there has been racial hatred in our own hearts, we would seek forgiveness and reconciliation. Pray that we would reach out to people who look, speak, and live differently than we do and be willing to love and sacrificially serve. Friday – Pray for wisdom for our government leaders as they make decisions concerning our future welfare. Pray that elections and bi-partisian politics would not control or steer the conversations or decision-making but humility, wisdom, and the fear of the Lord. Saturday – Pray for healing and revival for our nation, beginning with healing and revival of your very own heart. Pray that you would seek God through His Word and prayer, more than you ever have before, and the spark that is ignited in you would fan into flame an entire nation seeking His glory. Prayer isn’t one thing we can do; it is the thing we can do. So put on your running shoes, hit your knees, and pray. The miles we cover in prayer are the only way we will finish the race in front of us.